Are unsightly varicose veins or spider veins making you feel less than confident to show off your legs in the hot Florida sun? Premier Vein & Vascular of Tampa and Largo have the solution for you. This minimally invasive outpatient procedure removes medium or large varicose veins through a tiny incision in the leg. This method of removing segments of veins is also known as ambulatory phlebectomy. A microphlebectomy is often selected for veins that are too large for more targeted treatments like sclerotherapy but too small for traditional, more invasive surgeries. Many patients appreciate that there is not much downtime after the procedure. Find out if you’re a candidate for a microphlebectomy by calling the vascular experts at Premier Vein & Vascular at 1-888-VEINCARE. Sclerotherapy is considered the gold standard for getting rid of small, unsightly varicose or spider veins. It involves injecting veins with a solution to collapse the vein, forcing the blood to reroute itself through nearby, healthier veins. There may be some mild discomfort during the procedure but it shouldn’t last more than a minute or two. In some cases, more than one session may be required to eliminate your varicose or spider veins. This quick, in-office procedure will remove unwanted veins but it will not prevent future veins from becoming a problem. Thus, any underlying issues will need to be addressed, possibly requiring lifestyle changes (such as wearing compression stockings or losing weight) or other treatments. Patients generally experience a 40 percent improvement in the appearance of small varicose or spider veins after a sclerotherapy treatment, and the results are long-lasting. It is important to walk regularly to encourage good circulation after you have had sclerotherapy. You should not participate in any strenuous activity in the initial days after your treatment. Ultrasound-guided sclerotherapy is useful for treating deeper veins that are not outwardly visible and for larger superficial veins that will not respond to other measures. Like sclerotherapy, it involves injecting a solution directly into the problem vein so that it shrinks and collapses. But in this case, deep and large veins are accessed with the help of ultrasound imaging, which maps the veins, guides the needle tip to the targeted vein, and helps control the direction of the injection. Ultrasound-guided sclerotherapy improves the safety, accuracy, and effectiveness of the procedure. Not only is this procedure ideal for eliminating diseased veins that have typically required surgical removal, but it has the added benefit of triggering the residual disappearance of smaller nearby varicose veins, as well. 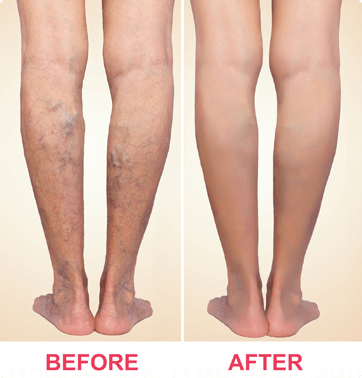 Say goodbye to spider veins and varicose veins. The vascular health professionals at Premier Vein & Vascular are knowledgeable and experienced in eliminating those confidence-destroying problems. Schedule your appointment today by calling 1-888-VEINCARE or use our convenient online appointment request form.